Basal cell carcinoma is one of the most common skin cancers, occurs mostly in middle aged people, and is more probable for the fair complexion people. The treatment modalities for skin cancers are surgical excision, radiotherapy and chemotherapy. Each treatment modality has its own advantages and disadvantages. Removing the affected area by surgical excision is usually preferred in many cases, but the recurrence rates after treatment are high. Radiotherapy treatment using external beam therapy is too expensive and it also delivers unnecessary dose to underlying normal tissues. Chemotherapy has its own side effects. Mould or superficial brachytherapy is a promising alternative treatment method for such skin cancers, where high-energy beta emitting radio-nuclides such as 32 P, 90 Sr/ 90 Y, 188 Re are used to overcome the disadvantages of radiotherapy and surgery. In superficial brachytherapy, prescribed dose can be delivered to the affected area without excessive damage to the neighboring normal tissues. This technique is simple, less trauma to patients, and less expensive as compared to external beam therapy. Pandey et al., reported the use of 32 P cellulose-based adsorbent paper skin patches to control the tumor regression in C57BL6 mice bearing melanoma. Park et al.,  studied the use of 32 P ophthalmic applicator after pterygium and glaucoma surgeries. They demonstrated that dose distributions obtained using the 32 P source is beneficial for reducing the incidence rate of radiation-induced cataract and it can deliver therapeutic doses to the surface of the conjunctiva while sparing the lens better than the 90 Sr/ 90 Y applicators. Xu et al.,  investigated the therapeutic effects of the chromic phosphate particle-based 32 P source in a rabbit VX 2 lung tumor animal model and found that the tumor volume significantly decreased after implantation of source particle. 32 P is a suitable radioisotope for such therapeutic application due to many advantages over other beta emitting radioisotopes. It is a pure beta emitter with maximum energy of 1.71 MeV. Its half-life is 14.2 days. Hence it is less hazardous material from transportation, storage, and waste disposal point of view. The maximum range of 32 P beta particle in soft tissue is 8 mm (the average range is 3 mm). Due to its short range, there will be negligible radiation dose to the underlying healthy normal tissues and bone. 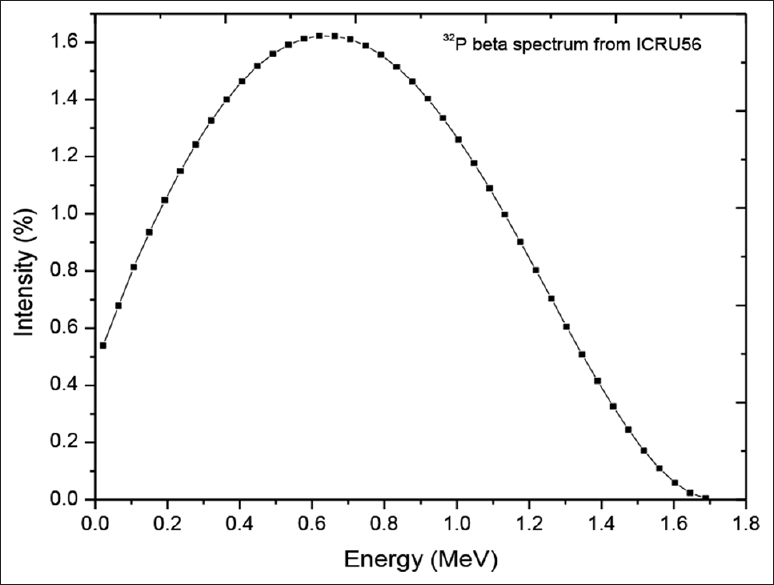 The 32 P beta spectrum [see [Figure 2]] needed for the Monte Carlo calculation is based on ICRU Report No. 56. In the Monte Carlo calculations, it is considered that the source particles are uniformly distributed in the nafion patch of dimensions 1 cm × 1 cm × 100 μm. The water phantom was divided in to voxels of dimension of 0.25 × 0.25 × 0.25 mm 3 for generating dose profiles. Dose distributions in water are scored in these voxels. Separate simulation is carried out to score central axis depth dose by using bigger voxel dimensions (2 × 2× 0.25 mm 3 ). In the Monte Carlo calculations, all secondary particles such as knock on electrons and secondary bremsstrahlung photons produced by primary source electrons are completely followed in the simulation. The PEGS4 dataset needed for EGSnrc calculations is based on the XCOM compilations. The PEGS4 dataset is generated by setting AE = ECUT = 0.521 MeV and AP = PCUT = 0.01 MeV, where the parameters AE and AP are the low energy thresholds for the production of knock-on electrons and secondary bremsstrahlung photons, respectively. The variation of the dose values per unit activity (GyBq -1 ) as a function of depth (mm) in water for the 32 P-nafion-patch source is shown in [Figure 3]. The dose decreases rapidly with increasing depth in water. Central axis dose at 4 mm depth in water is only 0.08% of the central axis surface dose. Such a rapid decrease in dose will result in better sparing of the normal tissues. [Table 2] compares the values of central axis depth dose per unit activity (GyBq -1 ) of 32 P-nafion-patch source with the corresponding values of 32 P-silicon-patch  for different depths in water. Higher dose rate values are observed in the case of 32 P-silicon-patch source, because the radioactivity is distributed in lesser surface area (0.196 cm 2 ) as compared to 32 P-nafion-patch source, where surface area is 1 cm 2 . For treatment time calculation, 1 mm depth from the surface along the central axis of the source is considered as reference depth. 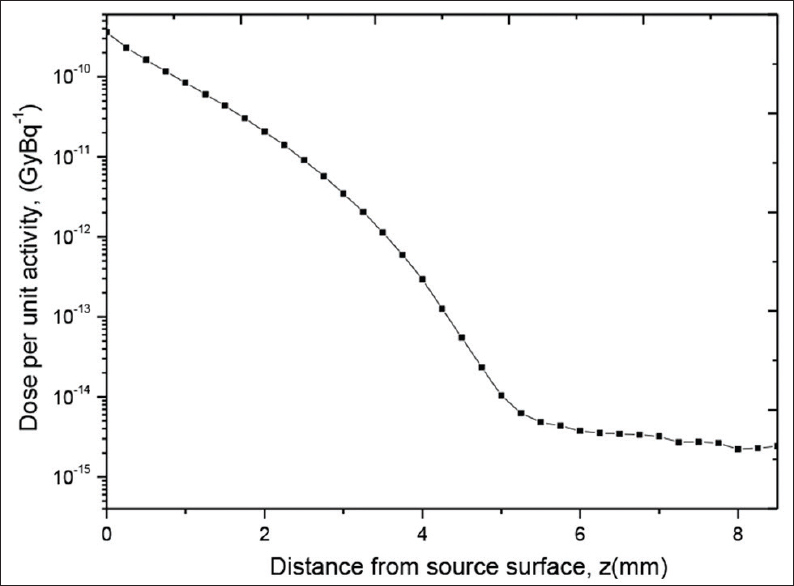 The value of dose in water calculated at 1 mm from the source surface is 8.41 × 10 -11 GyBq -1 . Hence, the time required to deliver a therapeutic dose of 30 Gy for a 37 MBq of radioactivity distributed in 1 cm 2 of 32 P-nafion-patch source is about 2.7 hours. 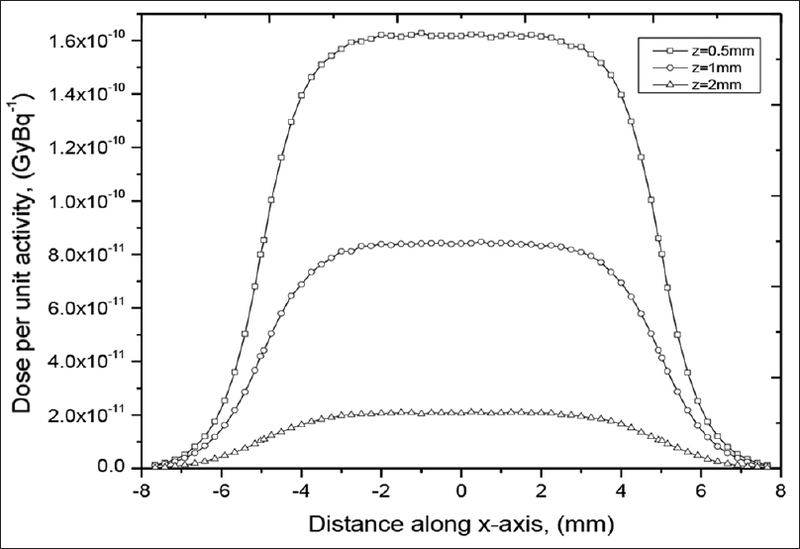 [Figure 4] presents the dose rate profiles along the x-axis of 32 P-nafion-patch source for three different depths z = 0.5, 1 and 2 mm from the source surface. 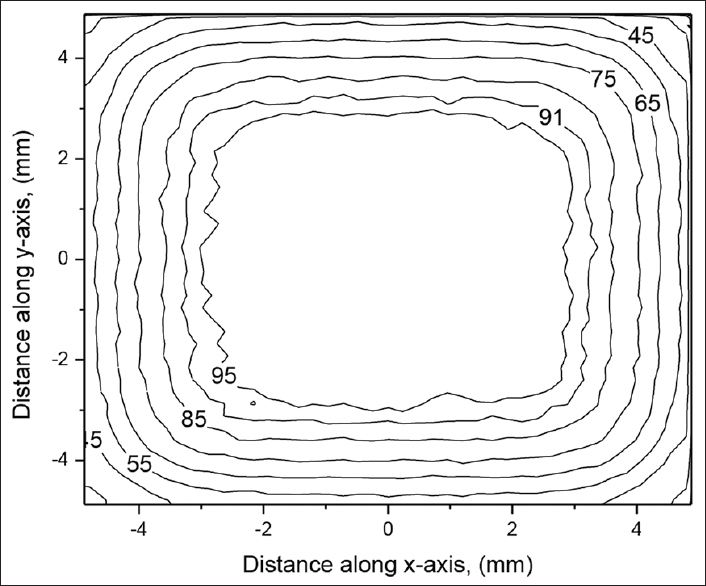 [Figure 5] presents normalized dose values along the x-axis at depth 1 mm. 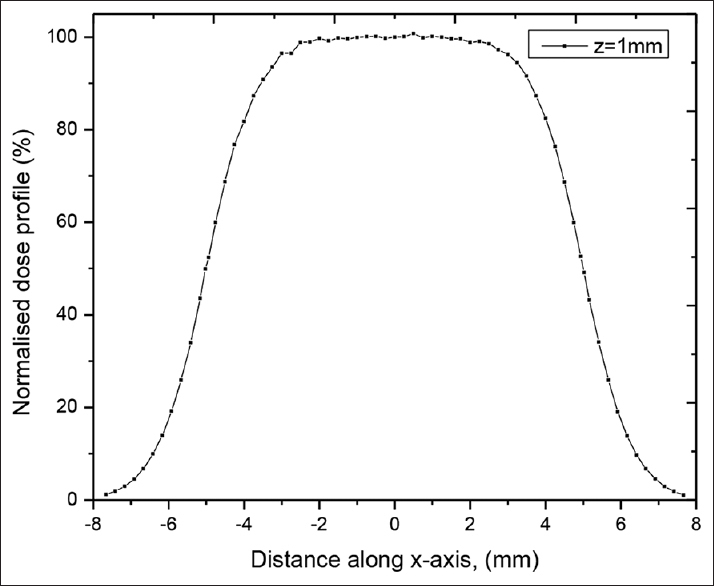 The central axis dose value at 1 mm depth is used for normalization. 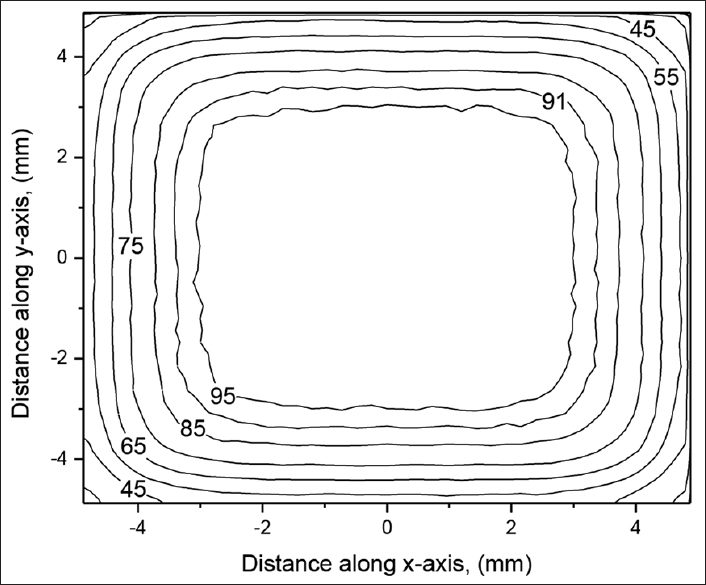 Dose rate value at 3.5 mm away from the central axis is about 91% of the central axis value. Whereas dose rate at 5 mm away from the central axis is only 50% of the central axis value. 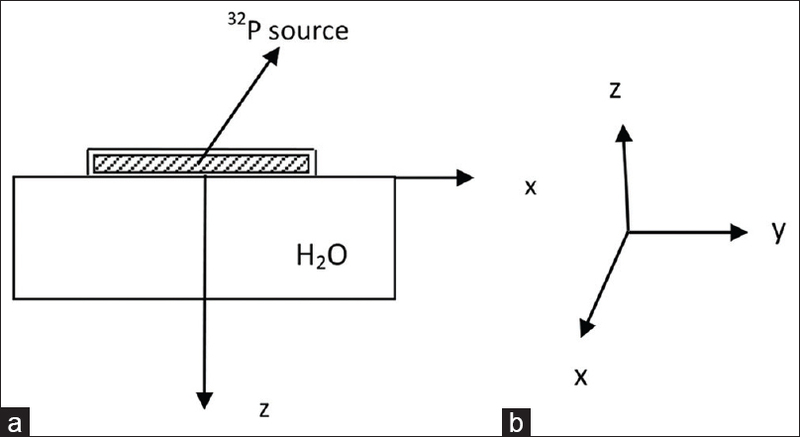 [Figure 6] [Figure 7] [Figure 8] show isodose profiles of the 32 P-nafion-patch source at depths of 0.5, 1, and 2 mm. About 3.25-3.5 mm distance around the central axis is covered by about 90% isodose line for depths of 0.5, 1, and 2 mm. Hence, the 32 P-nafion-patch source is effective for treatment of approximately 6.5-7.0 mm diameter lesions. 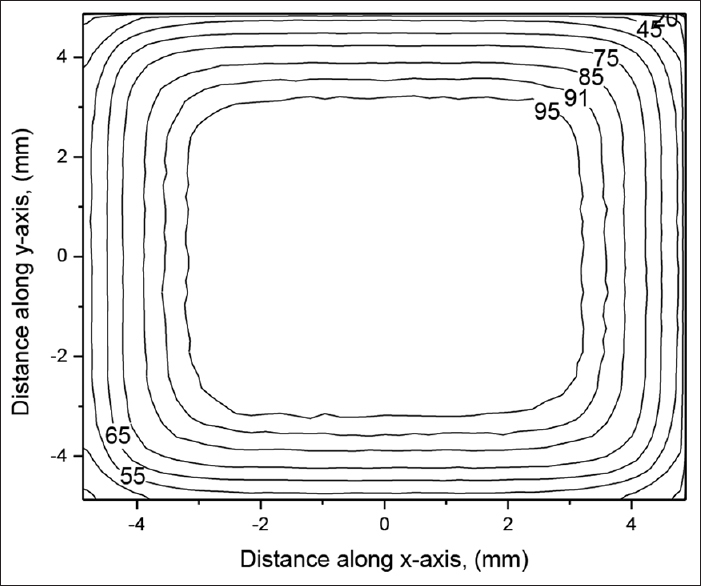 Dose distributions for the indigenously developed 1 cm × 1 cm 32 P-nafion skin patch source are calculated using the Monte Carlo-based EGSnrc code system. The calculated treatment time for delivering therapeutic dose of 30 Gy at 1 mm depth along the central axis of the source involving 37 MBq activity is about 2.7 hrs. This source is effective for treatment of approximately 6.5-7.0 mm diameter lesions. The authors would like to thank Dr. D. N. Sharma, Formerly Director, Health, Safety and Environment Group, Bhabha Atomic Research Centre for his encouragement and support for this work. Kopf AW. Computer analysis of 3531 basal cell carcinomas of the skin. J Dermatol 1979;6:267. Lee JD, Park KK, Lee MG, Kim EH, Rhim KJ, Lee JT, et al. Radionuclide therapy of skin cancers and Bowen's disease using a specially designed skin patch. J Nucl Med 1997;38:697-702. Mukherjee A, Pandey U, Sarma HD, Pillai MR, Venkatesh M. Preparation and evaluation of 90 Y skin patches for therapy of superficial tumors in mice. Nucl Med Commun 2002;23:243-7. Mukherjee A, Pandey U, Sarma HD, Gupta SK, Ingle AD, Pillai MR, et al. Bioevaluation of radioactive bandages in a murine model of melanoma. Int J Radiat Biol 2003;79:839-45. Jeong JM, Lee YJ, Kim EH, Chang YS, Kim YJ, Son M, et al. Preparation of 188 Re labeled paper for treating skin cancer. Appl Radiat Isot 2003;58:551-5. Pandey U, Saxena SK, Sarma HD, Tandon P, Ram R, Samuel G, et al. Bioevaluation studies of 32 P incorporated mould brachytherapy sources for potential application in treatment of superficial tumors. Nucl Med Commun 2008;29:717-23. Park YK, Ye SJ, Kim IH, Wee WR, Kim MK, Han HS, et al. Potential use of 32 P ophthalmic applicator: Monte Carlo simulations for design and dosimetry. Med Phys 2008;35:1854-8. Xu YP, Yang M, Pan Dh, Wang Lz, Liu L, Huang P, et al. Bioevaluation study of 32 P-CP-PLLA particle brachytherapy in a rabbit VX2 lung tumor model. Appl Radiat Isot 2012;70:583-8. Salgueiro MJ, Duran H, Palmieri M, Pirchio R, Nicolini J, Ughetti R, et al. Design and bioevaluation of a 32 P-patch for brachytherapy of skin diseases. Appl Radiat Isot 2008;66:303-9. Salgueiro MJ, Duran H, Palmieri M, Pirchio R, Medina V, Ughetti R, et al. Bioevaluation of 32 P patch designed for the treatment of skin diseases. Nucl Med Biol 2008;35:233-7. X-5 Monte Carlo Team. MCNP-A General Monte Carlo N-Particle Transport Code, Version 5. Los Alamos National Laboratory, Los Alamos, NM, USA; 2003. Rogers DWO, Kawrakow I, Seuntjens JP, Walters B, Mainegra-Hing E. NRC user codes for EGSnrc, NRCC Report No. PIRS-702 (rev. B). National Research Council of Canada, Ottawa, Canada; 2010. Sahoo S, Palani Selvam T. Comment on "Design and bioevaluation of a 32 P-patch for brachytherapy of skin diseases" [Appl. Radiat. Isot 66, (2008) 303-309]. Appl Radiat Isot 2014;91:62-3. Gao W, Liu L, Liu ZY, Li XD, Li C. Interstitial injection of 32 P-chromic phosphate during lung cancer resection to treat occult lymphatic metastasis. Nucl Med Commun 2009;30:420-6. Saxena SK, Kumar Y, Dash A. Nafion-zirconium phosphate composite membrane: A new approach to prepare 32 P patches for superficial brachytherapy applications. Cancer Biother Radiopharm 2012;27:276-84. Testing and classification of sealed radioactive sources. AERB Safety Standard No. AERB/SS/3 (Rev. 1); 2001. Kawrakow I, Seuntjens JP, Rogers DW, Tessier F, Walters BR. The EGSnrc code system: Monte Carlo simulation of electron and photon transport, NRCC Report No. PIRS-701. National Research Council of Canada, Ottawa, Canada; 2013. IAEA-Tecdoc-1274. Calibration of photon and beta ray sources used in brachytherapy. March; 2002. Walters B, Kawrakow I, Rogers DWO. DOSXYZnrc users manual, NRCC Report PIRS-794 (rev. B). National Research Council of Canada, Ottawa, Canada; 2009. ICRU Report No. 56. Dosimetry of external beta rays for radiation protection, International Commission on Radiation Units and Measurements, Bethesda, MD; 1997. Berger MJ, Hubbell, JH. XCOM, Photon cross sections on a personal computer, Report no. NBSIR 87-3597. Gaithersburg, MD. NIST; 1987. Walters BR, Kawrakow I. Technical note: Overprediction of dose with default PRESTA-I boundary crossing in DOSXYZnrc and BEAMnrc. Med Phys 2007;34:647-50.